Go ahead, bookmark this page, add it to your Pocket or do whatever you want so you can come back here for when we add more social mention tools to hear from your target audience. This social media listening tool supports Twitter, Facebook, Instagram, and a wide variety of forums and blogs for tracking real-time mentions of your brand. The tool allows you to identify people with the most social influence. Another great feature is the ability to easily segment by positive, negative, or neutral mentions. Access to Brand24 starts from $49 per month. Brandwatch makes it possible to view brands against the backdrop of key insights from almost 100 million web traffic sources across the web. The tool allows you to monitor social media networks such as Facebook and Twitter, blogs, news sites, forums, review sites, and more. Brand perception and monitoring is only the beginning. Listening tools for social media like Brandwatch enables its users to engage and respond to target communities, assign workflow, and handle mentions on social media with ease. This social listening tool monitors millions of sources in 42 languages, helping brand owners be aware of practically all mentions on social media, news sites, blogs, forums, and many web pages. The app makes it possible to assign tasks, keep track of actions, and share alerts. Over a period of time, you can get a mention snapshot by language or source by generating reports and exporting mentions. 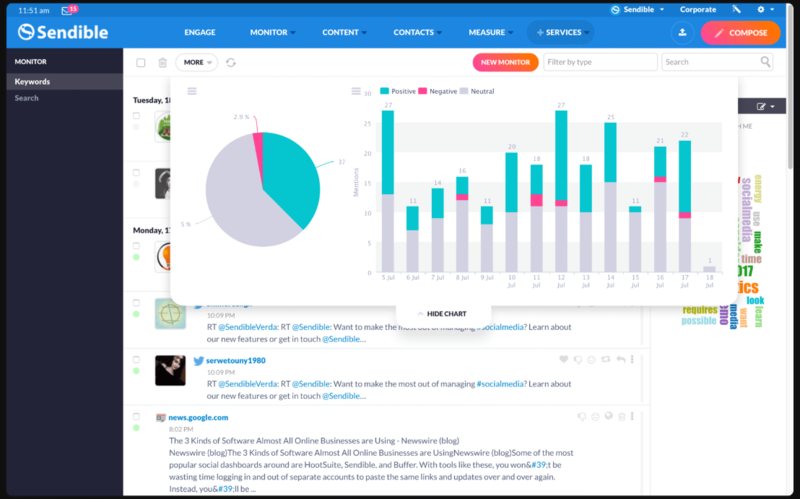 The tool comes with a free social media monitoring 14-day free trial. You will be informed every time your brand or target keywords are mentioned on Facebook, Twitter, Instagram, or any other major social network. Plans start from $29 per month. 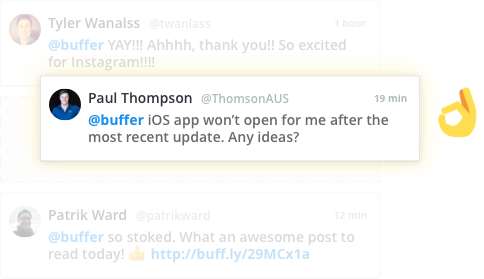 Buffer Reply is another fantastic listening tool for social media. The tool collects all mentions of your brand on Facebook, Twitter and Instagram and then puts them into one team inbox allowing you and your staff to reply with ease. Other features include the ability to add internal notes, assign staff, collision detection and much more. This tool offers personalized responses and the option to add GIFs and emojis. Buffer Reply has two paid plans. A 14-day free trial is also available. Plans start from $50 per month. 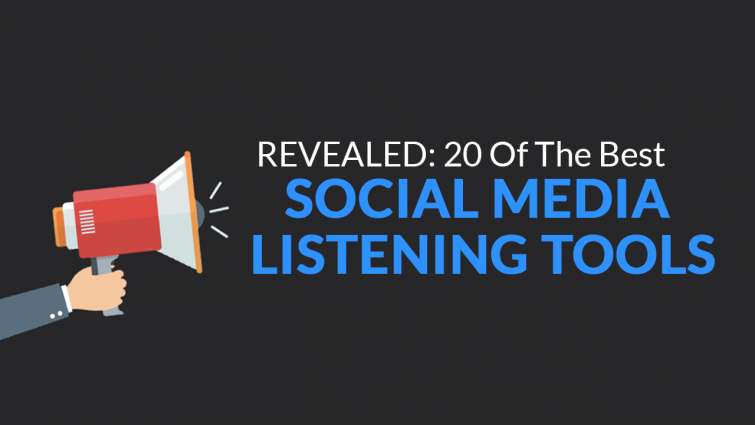 Hootsuite is one of the best free social media listening tools you’ll come across. It is heralded as one of the greatest social media management tools, covering a vast array of social networks. These include Facebook, Twitter, LinkedIn, Google+, WordPress, and Foursquare. Hootsuite allows you to do something that’s perhaps most crucial for the success of your brand – track anything and everything people are saying about it or you. If someone complains about your business, imagine the repercussions of not responding. It’s important to be able to react quickly so the issue doesn’t escalate! With Hootsuite, you can also track competitors’ brands – this could be a good way to win more customers. The weekly reports and outstanding team management options, which include sending private messages and delegating tasks, can come in quite handy. This is especially the case if social media accounts are being handled by more than one person. This listening tool for social media has a lifetime free account with limitations. Paid plans start from £25 per month. 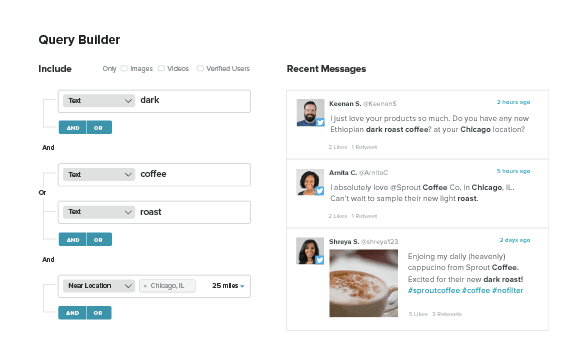 Sprout Social supports Twitter, LinkedIn, Facebook, Instagram, and Google+. This social media listening tool has two separate features for engagement and social monitoring. You receive all your messages and mentions in the Smart inbox. 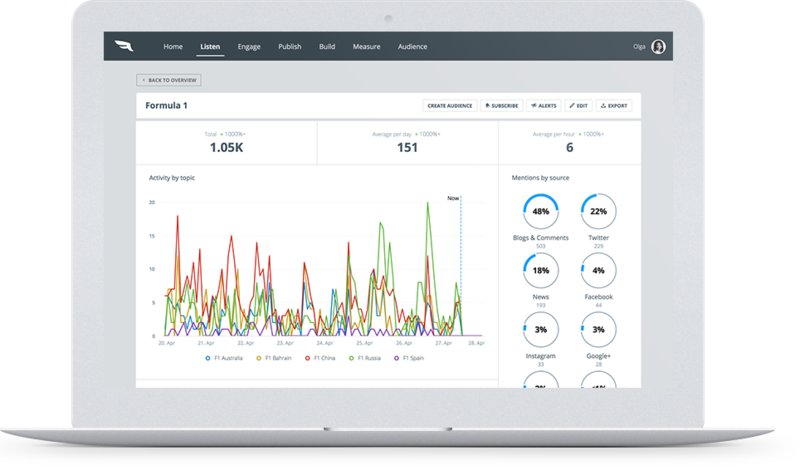 Sprout Social has real-time social media monitoring for keywords on Twitter and Instagram. Sprout Social also identifies key customers and VIPs. Plans start from $99 per user, per month. This straightforward, free search engine lets you specify the types of platforms you want to search, top users, top keywords, details on sentiment, and more, all in real time. There’s even data on how frequently a given brand is mentioned. All the data can be exported in a spreadsheet, which is quick and convenient. Agorapulse is an all-in-one social media monitoring tool that is equipped with scheduling, engagement, monitoring, and analytics features. 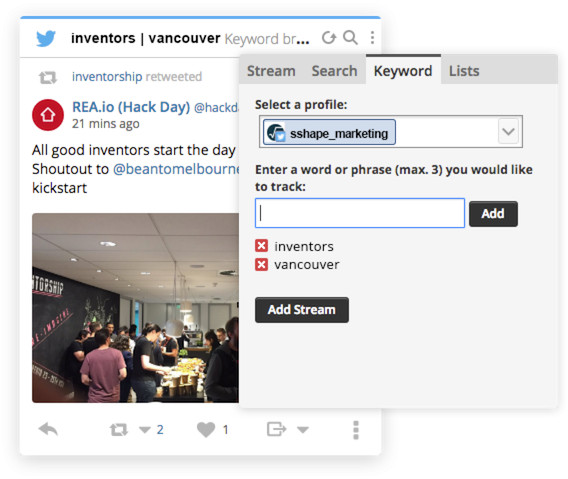 The inbox gathers all social media mentions of a given brand, while its listening feature enables you to search for URL, keywords, and handle on Twitter. Agorapulse also supports YouTube, Facebook, and Instagram. Plans start from €39 per month. With this tool, you can schedule and publish posts, analyze your social media performance, and monitor social activities. 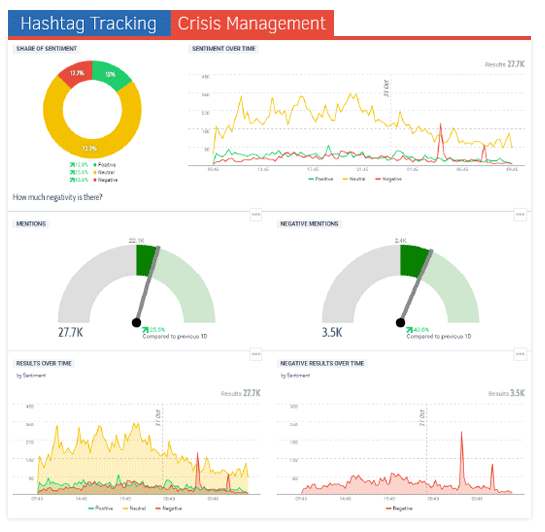 The Social media monitoring dashboard offers updates of how people are interacting with a brand in real time. It works particularly well for events, where you can engage with potential clients and monitor related social media posts. 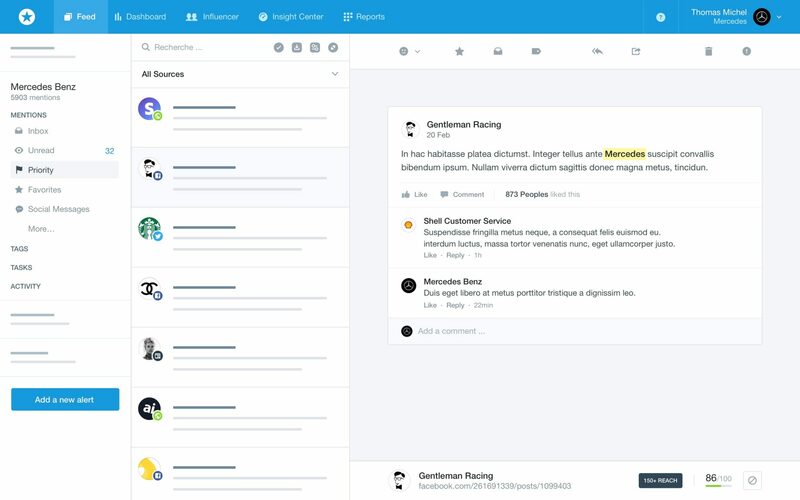 Falcon helps social media marketers with various tasks. It’s a social media management platform that also offers social listening features. 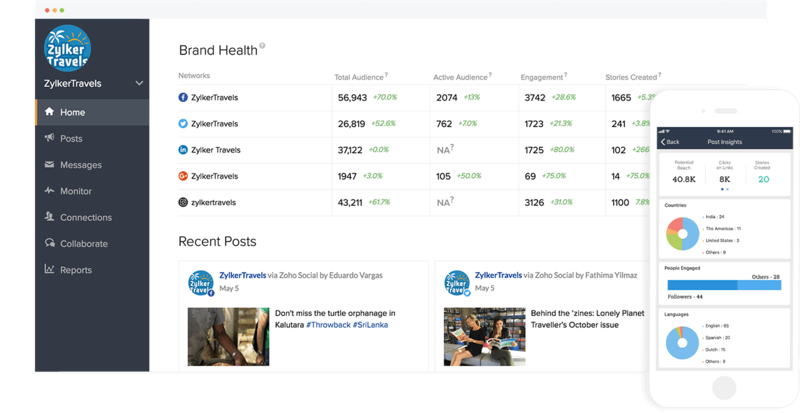 You can monitor brand mentions and discover influencers within the platform fairly easily. Falcon’s packages are all customizable, so pricing varies. With Sendible, you can respond to messages and comments from an inbox similar to Sprout Social. 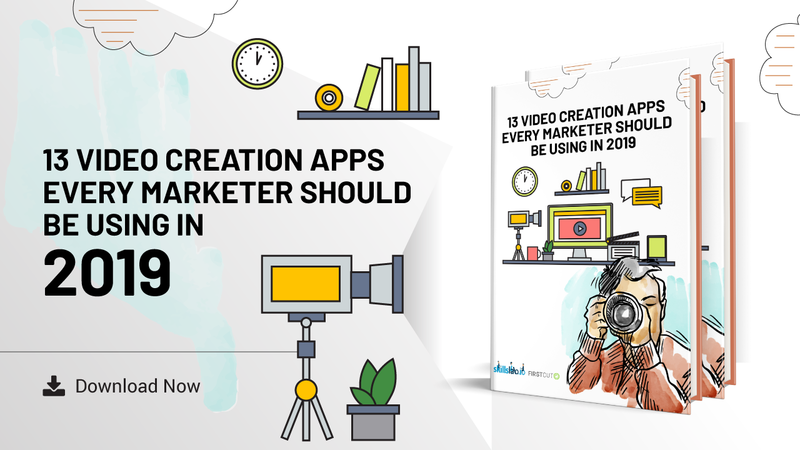 Other features include the ability to schedule and collaborate on social media content, monitor keywords and hashtags, and observe competing brands online. Sendible supports Facebook, YouTube, Twitter, Instagram, Google+, blogs, and Yelp among other review sites. Plans start from £25 per month. This tool covers any Twitter user’s basic needs, making it a good option for beginners. 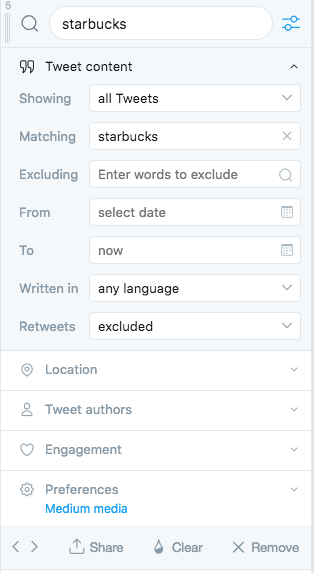 It can schedule tweets, monitor your messages and interactions, manage multiple accounts, and track hashtags/keyword mentions. It’s completely free, no costs involved. Iconosquare is a fantastic platform that supports both Instagram and Facebook. The tool offers scheduling, analytics and also social listening for the platforms. You can set-up feeds for specific pages you’re interested in too. 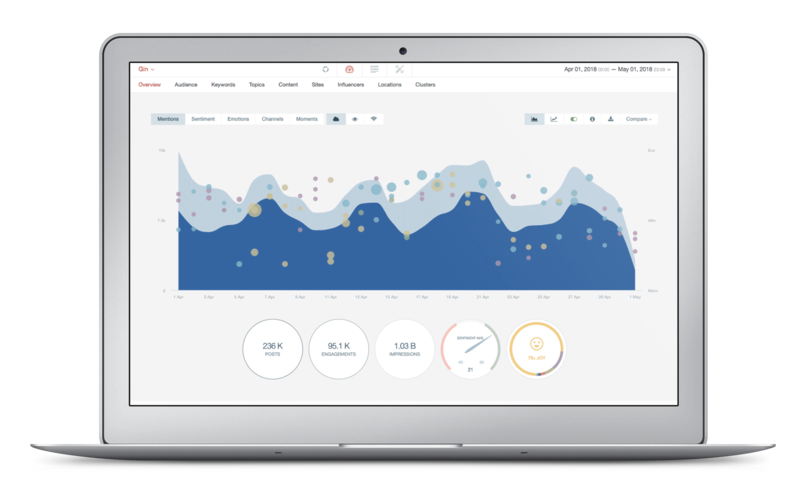 Pulsar is an excellent social media listening tool, which provides a number of tracking solutions, such as TRENDS, TRAC, CORE and RESEARCH. Pulsar TRAC is an advanced social listening tool that combines keyword, audience and content tracking all in one place. 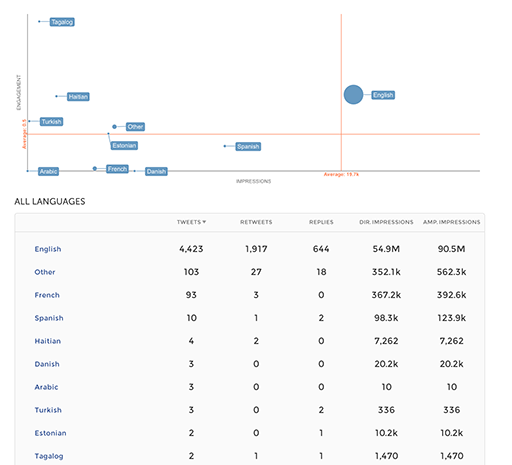 TRAC understands 185 languages, analyzes topics in 22 languages and tracks sentiment in 26 languages. Plans for Pulsar TRAC start from £650 per month. Sentione allows you to explore the web to collect online mentions of how your brand is perceived online. 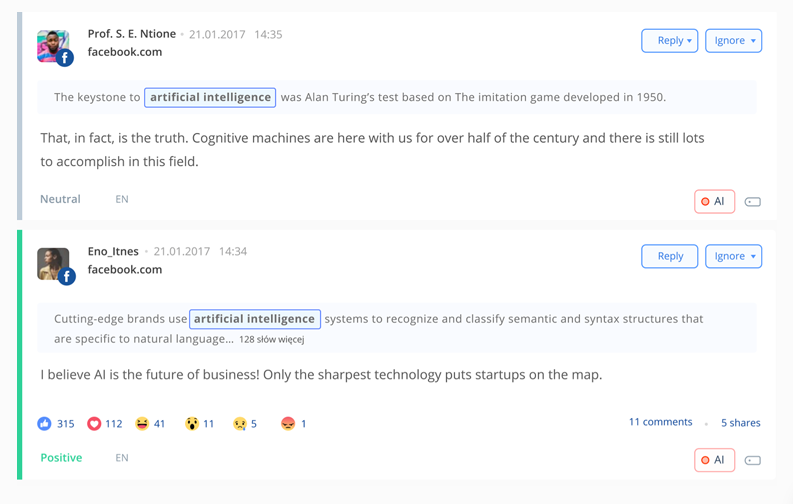 The tool monitors billions of discussions on thousands of web sources including news sites, blogs, forums, portals and social media networks. 💡 Read Next: What is Social Advocacy & How Do I Get Started? All data is real-time. Advanced queries can also be set-up to get relevant results. Plans start from £49 per month. Trackur is a handy tool that monitors all social media and mainstream news, including Twitter, Facebook, Google+. The tool allows you to grab your own API and get started immediately. One of the main features of Trackur is that it’s fully integratable. You can add media monitoring to your own tools and customer dashboards. Plans start at $390 per month. 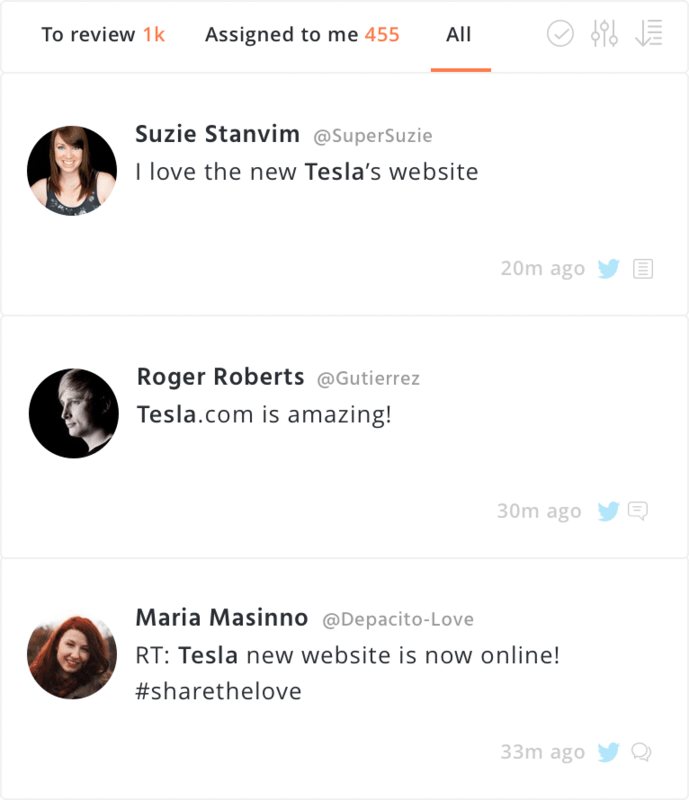 This tool makes it possible to find all trending topics and feedback about a brand in real time. The Trending Score, an exclusive feature, shows the latest trends and the likelihood of them being sustained. Brands can carry out research on content ideas with theme clouds focusing on emerging topics on major social media networks like Twitter, Facebook, and Instagram. Plans start from £6,240 per year. 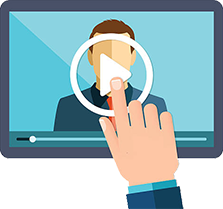 The Keyhole tool helps you save hours of time with live metrics and data that are always ready to be shared. You can monitor your own brand across social media and the web all in one place, whilst keeping an eye on your competitors. Keyhole will notify you about any users that post about your brand with negative sentiment right away. Plans start at $199 per month. The Union Metrics tool comes equipped with many handy features. 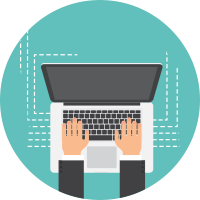 These include; Profile analysis, Keyword listening, Campaign reporting, Competitive analysis and Research. The keyword listening feature analyzes brand and industry conversations in real time, to identify key content and influencers. Plans start at $49 per month. This tool is best-known for its summary features, letting brands understand their audience at a glance. Access to key demographic data is possible this way, improving awareness of who is discussing the brand and of relevant keywords and platforms. 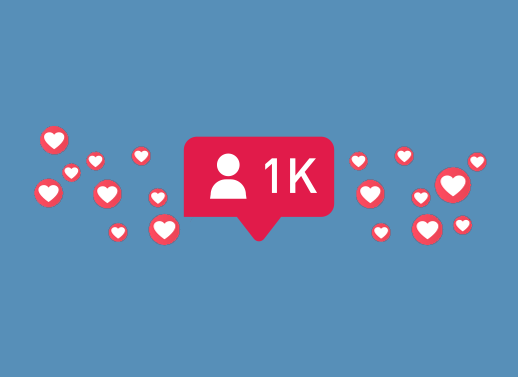 Linkfluence offers sentiment and emoji analysis on Twitter, Facebook, and Instagram as a way to optimize the brand’s communication and marketing strategy. Quotes are available upon request. It can be hard to make progress without listening to what your target group has to say about you, competing brands, and the industry in general. We hope this list has been informative – with the data you need, you can perform an analysis, understand your clients better, and improve your marketing strategy.